Last month my long time friend Sally contacted me and asked if I’d be interested in doing a newborn photo shoot for her soon to be born grandson. I jumped at the chance – I mean, a baby? And photography experience? Oh, YES. 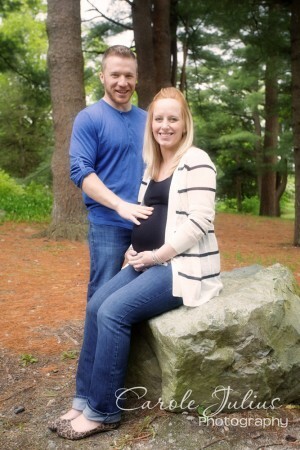 And then I asked Sally if maybe her daughter and son-in-law would like to do a maternity shoot first. I thought it would be a great chance for all of us to get to know each other and get comfortable with each other before the baby photos. I was thrilled when they agreed and so, on a cloudy Friday a few weeks ago we met up at the Natural Resources Trust in Easton. I took 175 photos in about 45 minutes and it was so much fun! Of course, it helps that Chad and Laura are the cutest couple ever. Right? They were so easy to work with and, even though I was very nervous initially, I soon felt comfortable and they did, too. We wandered around a bit, taking a few photos sitting on this rock, posing here and there. 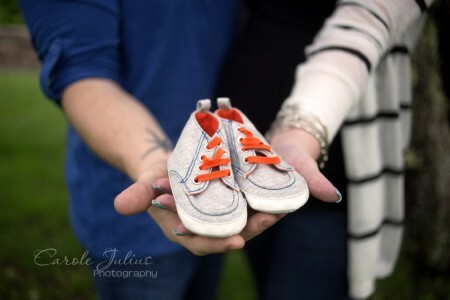 They brought this sweet little pair of baby sneakers along so we used those in a couple of photos, too. I mean. How cute is that? I can’t even stand it. And this. Laura, could you be any more serene and beautiful? Like, could you look a little bloated, please, instead of this amazing? Thank you, Laura and Chad and Sally for this wonderful opportunity. I can’t wait to do it again with the baby on the outside. Oh Carole, the photos came out just amazing & beautiful!!! I was hoping we’d get a sneak peek. 🙂 Even though I knew you’d do a great job. You captured this young couples joy and excitement so beautifully as they wait for their little one. What a treasure these will be for them in the years to come! Great job!!! Congratulations to Laura & Chad on their little one! Carole, those are wonderful pictures. Great job! 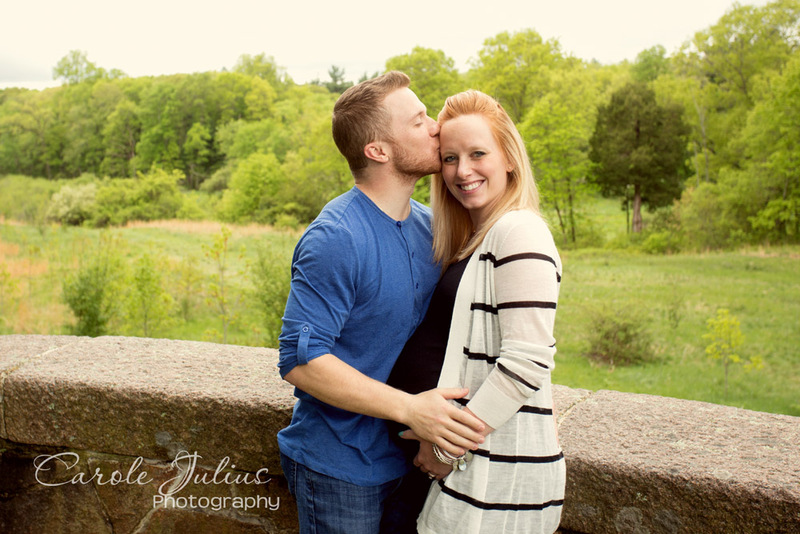 Wonderful photos, and I simply am bursting with excitement for you to do the newborn photos!!! You can tell they’re having a fun time and they are very happy about their future! I LOVE the sitting on the rock photo – he’s looking at her, and she’s looking at us. 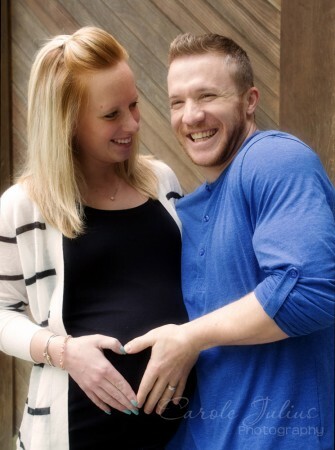 Chad and Laura look so happy and excited and you captured that really well! These are very touching photos. 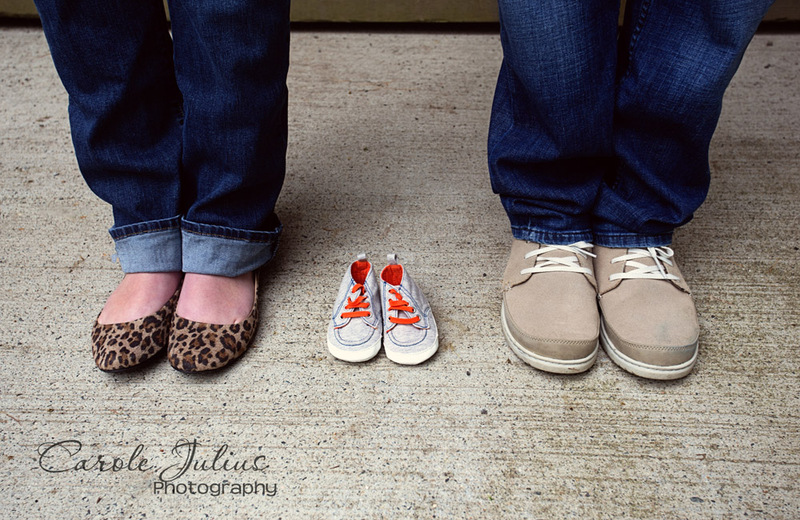 The little,shoes between the two larger shoes is just plain sweet! Soooooooo fun! And the sneaker shots are precious! Great job Carole! Nicely done! I bet you had as much fun as they did! Beautiful! Of course, I admire anyone who can actually SEE through a viewfinder (I literally point and click, hoping for the best) but even I can see you have an amazing talent! (I have no idea how I missed this post earlier! I’m so glad I found it.) Carole — what wonderful shots! You did an artful job at capturing their joy and anticipation. Just beautiful! And those little shoes. . .